KUALA LUMPUR: KUB Malaysia Bhd, controlled by Umno-linked Anchorscape Sdn Bhd with a 52.17% stake, said its A&W quick-service restaurant chain in Malaysia remains for sale, but it is waiting for the right price to sell. “We’re looking to sell A&W (M) Sdn Bhd for the right price. We had received several offers, but none of them came close to what we were looking at,” its president and group managing director Datuk Abdul Rahim Mohd Zin told The Edge Financial Daily in an interview. A final decision on buyers for the business still has to come from the master franchisor for A&W, A Great American Brand LLC. “It (A Great American Brand) needs to see that whoever ends up buying the business will have the means to take it further,” he said. KUB is currently in an extended franchise agreement with A Great American Brand until June 2019. Under the agreement, KUB is obliged to open 25 new A&W restaurants in three years, which will bring the total number of A&W restaurants in Malaysia to 52 by the end of 2019. Although KUB is committed to honouring the contract, Abdul Rahim said it is on a capital rationalisation phase as it embarks on a strategic plan to refocus its business activities on three core sectors, namely energy, information and communications technology (ICT), and agro. “We think that too much capital investments are required [to open new A&W outlets]. Additionally, we have decided to focus our attention on the three new sectors, which will require a lot of funds to expand them. As such, we have to rationalise our capital expenditure (capex),” Abdul Rahim said. The group is setting aside RM100 million for capex in 2018. Still, KUB will take the necessary steps to preserve the value of A&W Malaysia but it hopes to sell the business before the franchise agreement expires in 2019 in order to maximise the value of the company. Abdul Rahim said KUB has set a strategy with the objective to grow its market capitalisation to RM500 million by 2020, driven by its three core businesses of energy, ICT, and agro. The stock closed unchanged at 47 sen last Friday, with a market cap of RM261.54 million. “To achieve that target, our earnings should be more than RM60 million. I definitely think this is achievable if our plans materialise accordingly,” he said, adding that it is looking at a price-earnings ratio of about seven to eight times. KUB’s net profit surged 2.9 times to RM22.54 million for the financial year ended Dec 31, 2016 (FY16) from RM7.85 million in FY15, while revenue rose 14.7% to RM495.77 million from RM432.15 million. 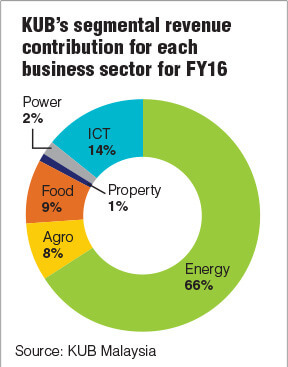 The energy business contributed 66% or RM325.2 million to the group’s total revenue in FY16, followed by ICT at 14% or RM70.5 million. Food business made up 9% or RM46.9 million of total revenue, while agro business contributed 8% or RM39.7 million. Abdul Rahim said earnings growth for FY18 will be driven by the energy and agro businesses. For the energy sector, KUB plans to push the sales volume of its liquefied petroleum gas (LPG) this year by building its own refrigerated LPG terminal at Westports in Port Klang, Selangor. KUB in May last year inked a memorandum of understanding with Singapore’s Mabanaft Pte Ltd for the development of the terminal, with a definitive agreement slated to be signed by the first quarter of 2018 and construction to commence by the second half of the year. “With the refrigerated LPG terminal in place, we hope to trade LPG more efficiently and be able to cut down our costs of imports. In terms of volume, we are looking to increase it to one million tonnes a year,” he said. For agro business, KUB last year acquired a a brownfield oil palm plantation land in Sungai Kinabatangan, Sabah, for RM100.45 million, which is expected to contribute 31% of the group’s annual agricultural business revenue. While the yield from the newly acquired land is expected to contribute immediately, KUB is undergoing a replanting exercise for its existing plantation land in Kluang, Johor, and Mukah, Sarawak, as the plantations are past their peak of maturity. “We started the replanting exercise for about 200ha last year, and we shall continue to do that in the next few years. The brownfield land that we acquired in Sabah fits right into our plans,” Abdul Rahim said. “For 2018, we don’t have any plans to acquire more plantation land because the Kinabatangan acquisition was quite a substantial one. There’s a lot of work to be done after taking over the plantation. We are targeting that the yields from the new land will be more than enough to offset the loss we incurred to take in the area undergoing the replanting exercise,” he added.